The DEFIANT SOUL is by far the best option in the strongest HP (hook potential) segment of the Roto Grip arsenal. Its guts are the asymmetrical Paragon™ core used in all of its predecessors in the HP-4 line. Though it has a rather large asymmetical core, the DEFIANT SOUL is not by any means sluggish about getting into a good strong roll. Yet I still find that it provides a clean and smooth move through the fronts and the early part of the midlane. In my opinion, the grit is what makes all the difference in this ball! With its 77H™ hybrid reactive coverstock, the DEFIANT SOUL completely outshines the original DEFIANT with a much more angular ball motion (though I still wouldn't call it "flippy") and undeniably better continuation through the pins. I drilled my first DEFIANT SOUL with an "old reliable" stacked leverage layout (Pin to PAP = 3.5). As its H grime rating suggests, it has proven itself to me to be a great weapon on heavier volume or tighter playing patterns. What I have most liked about it from the get-go is how reliable and consistent the ball motion is and how effectively it allows me to still use finesse and some of my "oldschool" hand position adjustments in order to create carry. Not every high performance ball gives me that option these days! Because of how steady and reliable the DEFIANT SOUL is - even being a high performance "strong" ball - it has been a great weapon for me on flatter sport patterns as well. The most impressive and satisfying performance I've gotten out of the DEFIANT SOUL was one of my first tournament outings with it. 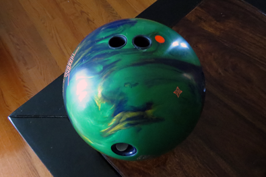 It gave me a great look at the USBC Masters this year (30ml - 39 foot - 1.9 to 1 ratio pattern). It proved to be the primary ticket to my success - helping me average 230 for my last qualifying block on the fresh, getting me into match play, and bringing me victories in my first two matches with 298-739 and 684. I have to say, too, that the DEFIANT SOUL is the first ball in a while that I've found it desirable to have more than one of in my arsenal. While at the Masters, I drilled up a second with the Pin over the center of my bridge and the PSA right next to my thumb. Again the predictability and reliability of the ball came through as it performed for me in just the way that I hoped it would with that layout - a little more stored up energy for a little more length and a little more pop on the backend. That allowed me to free up my angles a little more when I needed to moving pair to pair without worry about it ever "squirting right" on me because it just rolls so darn well. After several months in my bag now, the DEFIANT SOUL hasn't worn out its welcome by any means. At this year's USBC Open Championships, it provided the best look for me in the Team Event and even at the start of Doubles. But for a handful of bad shots in those six games, my 1951 All Events total should have been at least a hundred better with the look the DEFIANT SOUL gave me! Good ball, not good enough shot-making in that instance! The long and short of it, in my opinion - I haven't seen anything else on the market lately that gives a bowler this kind of angular look without becoming too violent off the spot or too unpredictable/uncontrollable when a little transition starts to happen! Try one!